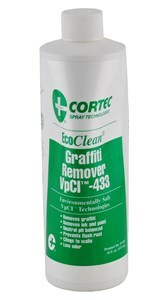 Cortec ECOClean 423 Graffiti Remover is a heavy-duty gel that removes inks and paints from metal, wood and concrete. This low odor cleaner is non-flammable and free of methylene chloride and ketones. 16 fl. oz. bottle. EcoClean products attack the toughest maintenance duties with respect for the environment. They incorporate nontoxic, biodegradable chemicals without aerosols, propellants, or ozone-depleting CFCs. Fast-acting, dependable, and safe to handle, EcoClean products lead the way in environmentally safe technology.